The long spotted legs of the goofy giraffe from Madagascar -- Melman Mankiewicz -- stand as the gateway to the “DreamWorks Animation Special Exhibition” at Seoul Museum of Art (SeMA), where children and adults alike can revel in the creative genius of DreamWorks animation. Meanwhile, the tunnel-like “Story” section documents the story-making process through the display of storyboards and videos that lead to the last section, “World,” that focuses on how the imaginary worlds in these stories come alive through film. “Many people (come)...kids and adults. School groups come. The kids get papers with questions about the exhibition they can fill out,” said Bark Song-ee, one of the staff members at the exhibition. Although kids do make up a sizeable percentage of the visitors, the exhibition has proven to be quite popular among all age groups. 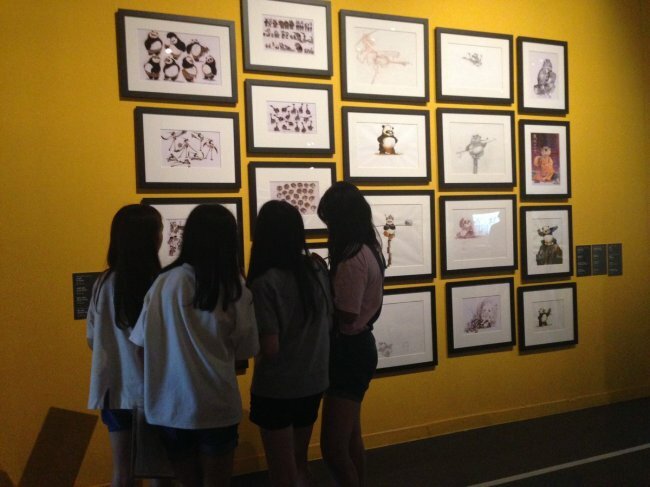 Lim Soo-ji, 29, and her friend Jo Mi-young spent considerable time not just viewing the exhibition but participating in it by drawing pictures of the characters on a drawing board station near the exit. By making the exhibition both an observatory and participatory experience, DreamWorks is able to more deeply fulfill its goal of instilling both creativity and technological innovation in the current and future generations. DreamWorks Animation, headquartered in Glendale, California, has released 32 feature animation films including blockbusters “Shrek,” “Kung Fu Panda” and “Madagascar,” making it one of the top three animation studios worldwide. SeMA is only the fourth museum in the world to host this exhibition after ACMI in Australia, ScienceArtMuseum in Singapore and the Museum of New Zealand Te Papa Tongarewa. The exhibition runs until Aug. 15. Tickets are 13,000 won for adults, 10,000 won for youths (13-18 years) and 8,000 won for children (7-12 years). The museum is closed on Mondays.